Prices for the revised Volkswagen Polo will start at £11,100 on the road when the facelifted model opens for orders next month. First deliveries of the updated Polo will start in July. While the exterior changes are minimal there are significant revisions under the bonnet with the introduction of the 1.0-litre three-cylinder petrol engine from the small Up. This turbocharged engine replaces the 1.2-litre and comes in two versions - 60PS or 75PS. Alongside it are two 1.2-litre TSI engines with either 90PS or 110PS while the existing 1.4 TSI ACT engine that features cylinder deactivation gets a power boost of 10PS giving it 150PS. Diesel options are two new three-cylinder 1.4-litre TDI engines, with 75PS and 90 PS. The Polo range starts with the S which gets a five-inch colour touchscreen, SD card reader, DAB, USB and aux-in connections, a height-adjustable driver’s seat, illuminated vanity mirrors, cup holders, and gloss black interior highlights. The S A/C model adds manual air conditioning. Moving up to SE trim adds 15-inch ‘Lyon’ alloy wheels, body-coloured door handles and electrically adjustable door mirrors, a leather-trimmed three-spoke multi-function steering wheel plus leather-covered gearlever and handbrake lever. It also includes a multi-function trip computer, remote locking, manual air conditioning and a Composition Media System with 6.5-inch colour touchscreen. The new SE Design model gets 16-inch ‘Portago’ alloy wheels, a black gloss radiator grille and door mirror caps, front fog lights, dark-tinted tail lights and rear windows along with LED number-plate illumination. Inside there are sports seats and aluminium-capped pedals. The SEL model builds on the specification of the SE, adding 16-inch ‘Rivazza’ alloy wheels, illuminated front footwells and a front centre armrest with storage compartment. Front and rear parking sensors are also standard. The sporty BlueGT model, which comes with a 1.4-litre TSI 150PS, has 17-inch ‘Montani’ alloy wheels and 15mm lower sport suspension along with a body styling kit including side skirts and unique bumpers, gloss black radiator grille and door mirror caps. Inside there are sports seats trimmed in ‘BlueSpeed’ cloth with Alcantara bolsters and a black roof lining. An XDS electronic differential lock for improved traction and handling is standard. 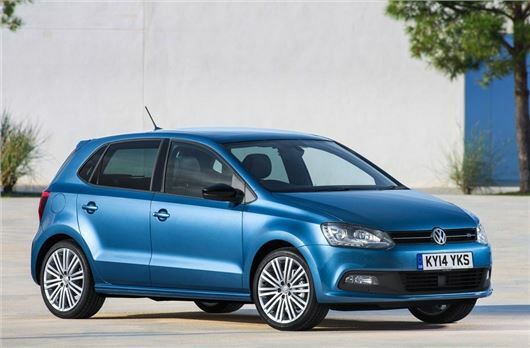 A new Polo BlueMotion TSI – the first petrol BlueMotion model in Volkswagen’s line-up – will be launched towards the end of 2014, along with the new Polo GTI which will be offered with a choice of either manual or DSG gearbox. Lovely car but VW taking the p--s with the prices. Would rather buy a used Golf for the same sort of money! !